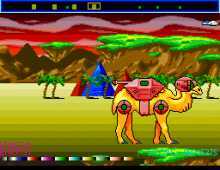 One of the best PC remakes ever, Attack of the Mutant Camels is a wonderful remake of Jeff "Yak" Minter's classic quirky shooter for the Atari and Commodore 64. The plot: evil aliens have invaded the peaceful world of Ungulonia. After an epic struggle they have been beaten back by the Ungulonian Limestone Peapods, and the occupied territory reduced to a small desert continent. But they have a cunning plan - they will have their revenge on the Ungulonians, thanks to their cybernetic, 150 foot high, heavily-armed camels. Nothing can withstand this devastating assault. Nothing... except you, of course. As fans of Jeff Minter have come to expect, AMC boasts an addictive and frenetic gameplay wrapped in a wacky and unique sense of humor that only Minter can provide. The game, in the designer's own words, "...was loosely inspired by the Walker sequence in Star Wars. The camels are not particularly well-drawn, and in fact look more like two fat men in a pantomime camel suit than proper camels. Also, note that although the cover artwork has bactrian (2-humped) camels, in the actual game the beasts are single-humped dromedaries." The gameplay is as simple as it can get. You start on the far right of the horizontally-scrolling map, with the camels on the left, marching relentlessly towards the right-hand end. Your mission is to disable the camels' cybernetic implants by shooting them, to free the captive dromedaries, who afterwards will gallop happily towards the safety of your base. Of course, as every die-hard fan of Minter can tell you, the game is not really that simple. The camels have huge firepower, and they attack in hordes. Along with the expected camels, you'll also find yourself fending off the incoming goats, lizards, technicolour cows, goldfish, and god-only-knows what else. A new type of enemy is introduced on almost every new level, so after a while the whole screen becomes very crowded with bad guys. It won't be long before you find yourself severely outnumbered - and having fun. Every once in a while, a brief interlude appears where you have to dodge ICBMs for ten seconds to win an extra life. This PC remake, as we can expect from RetroSpec meistros John Dow and John Blythe, is superb. The original game's addiction is left intact and enhanced with bright, colorful graphics. Sound effects are appropriately loud, with the usual explosions and high-pitched laser noises, and the excellent music is perfectly suited to retro gaming. Overall, if you enjoy mindless shooting games, this reincarnation of Yak's classic is simply a must-have - and you will find yourself addicted to its simple charm before long. Two thumbs up, way up!